Subhiksha plans Act II to capture consumer attention. But credit squeeze is hampering its expansion plans. Losing out on a first-mover advantage is not exactly something to crow about. But it’s a subject that R. Subramanian, Managing Director, Subhiksha, tackles with aplomb even as he fights an uphill battle to get the consumers to queue up at his stores. “Yes, we had problems with our back-end logistics,” he admits, when quizzed on poor brand recall value among customers who have also often decried the shortage of products at Subhiksha outlets—the most recent being a short supply of perishables at some of its stores. “Perishables (fruits and vegetables) pose certain challenges as it is a tough business to compete in—with roadside vendors who have no overheads whatsoever. Yes, it has huge advantages in terms of generating footfalls. However, in some stores, the net benefit between the increased walk-in frequency and the operating cost (mainly unsold scrap at the end of the day) may shift the logic the other way and so regional business units will take store-specific calls on the perishables,” he explains. That, of course, is a far cry from his earlier stated stance that there was no prospect of pain in the food business. Subramanian blames supply side logistics issues on the lack of technological upgradation by the retail chain. “Since the business was running on venture capital (ICICI Venture had bought a 38 per cent stake in March 2005 and sold off 10 per cent this year to Premji Invest for Rs 230 crore), it was important for us to cut costs and so we didn’t invest too much in technology,” he clarifies. It is only now, he adds, that the chain has started investing in technology for its back-end supply chain solutions. However, this has gnawed at the retail chain’s market share, which, despite over a decade of operations, is languishing at 10 per cent—a figure it achieved within 15 months of its launch in 1997. It explains Subramanian’s decision to identify verticals that could be spun off as independent retail stores and unlock substantial value for the retail chain’s top-line. Subhiksha Mobile, for instance, its stand-alone mobile retail outlets, contribute 25 per cent of its gross revenues. “This year, our mobile business should contribute Rs 1,000 crore in our total revenues of Rs 4,000 crore,” says a hopeful Subramanian. Next on the cards is stand-alone outlets for FMCDs. “The market share development for a discount retailer is slow. It took us 15 months to get to a 10 per cent market share, as the value of purchase is small. In mobiles and consumer durables, on the other hand, a discount retailer can achieve a 10 per cent market share within six months,” he points out. Busy wooing investors to fund his dreams, Subramanian’s strategy for consumer durables will be the store’s location, which will be high street rather than the immediate neighbourhood. “In FMCD, proximity means half an hour’s drive, since these are planned and not impulse purchases,” reasons Subramanian. 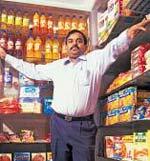 Since his outlets are all on rented premises, Subramanian is seeking a grand cash flow to fund his expansion plans. “We had put a freeze on our real estate plans as we expect a major correction in realty prices. Normally, real estate prices crack at a slower rate, but we are expecting a 25-35 per cent downturn within the next 3-4 months,” he observes. Accordingly, the company says they will be shutting down some stores and shifting them to locations with lower real estate costs, though staff at these stores disclaim any knowledge of an impending store closure. Subhiksha’s investment plans, too, have been stalled this year— the targeted Rs 1,000 crore investment is now being clubbed with a planned Rs 500 crore one in the next financial year. Interestingly, while he’s in no rush to cash out of the venture he started, Subramanian says he won’t turn a blind eye to offers if they are attractive enough. “You don’t run a business on sentiment but on logic. So, while obviously a 2X valuation would not be considered, something in the region of 10X would definitely be attractive,” he says. The question is: who would pay 10 times the current enterprise value—Rs 2,300 crore—to bail out what many consider a troubled ship?